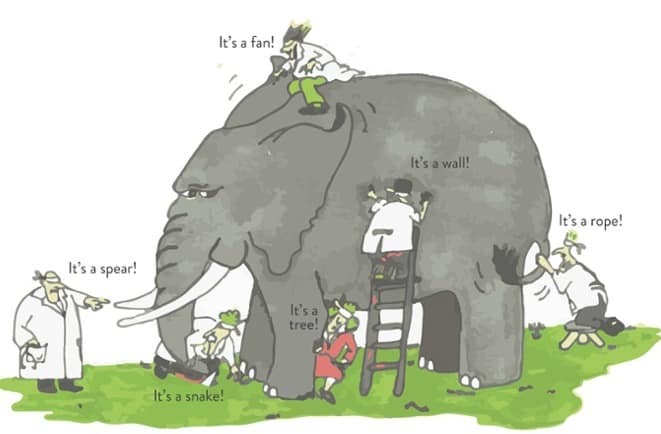 I just love the ancient parable about the elephant. Six blind men were asked to describe an elephant by touching its body parts. The first man felt its side and described the elephant as a wall, the second man touched its tusk and thought it was a spear, the third man felt its trunk and was confident it was a snake, the fourth touched the knee and believed it was a tree, the fifth felt the ear and thought it was a fan and, finally, the sixth held the tail and assumed the elephant was a rope. None of the blind men was wrong in his analysis because each was perfectly describing the body part he touched and felt. The problem came from their limited perception – they believed that they understood the situation, which led each of them to a mistaken conclusion. They missed the big picture – they were petting an elephant! The same applies to making data-driven decisions. When we have limited data and information, we don’t get the whole picture. And, the same is true in reverse – often when you get the big picture, you miss out on all the parts that go into its creation. We often say, “Impact is the bottom line of the social sector.” But, what does that mean? Impact is the figurative elephant in the room these days. We have been working to break down this important concept and make it real and sustainable for nonprofits. Interestingly, we have found that impact isn’t driven by systems. You can buy all the fancy tools and hire evaluation experts, but we have found that impact is best supported by a data-driven culture. We have spent the last three years studying and working alongside clients on this very question. 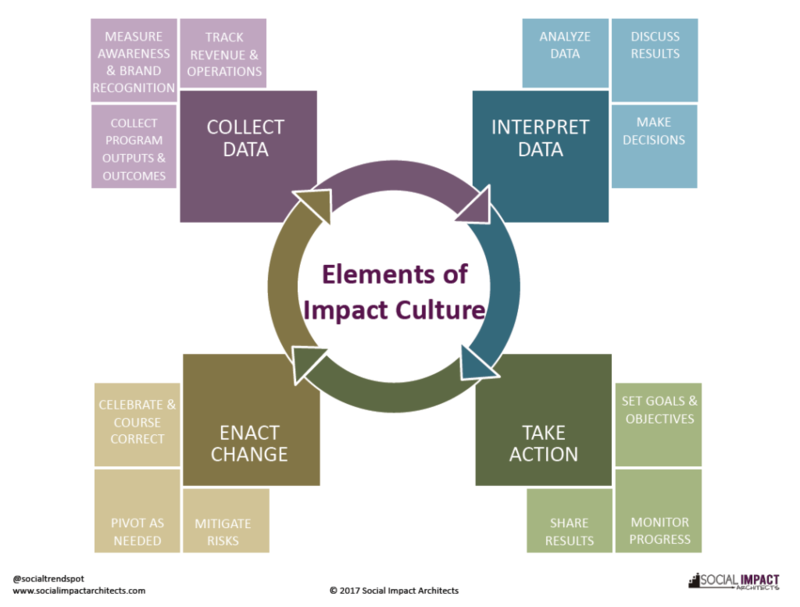 How can you build an impact culture* that is energized by data, curious to learn, takes deliberate action and embraces change? Like many things at Social Impact Architects, we always like to transform the most overwhelming content into easy-to-digest information, so we decided to create an Organizational Checklist for an Impact Culture. It is self-scoring, but in general your score should be connected to where you are in the nonprofit lifecycle. Level 1 loosely correlates with the start-up phase; Level 2, the growth phase; and Level 3, the maturity phase. Score on your own or score with your team as a fun self-assessment. Or, try what we do in our workshops: walk through each checklist item and ask everyone to give a thumbs up, thumbs down or thumbs to the side to gauge how embedded these elements are in your culture. Then develop a short Action Plan to address any deficits or use as a guide for Strategic Planning. 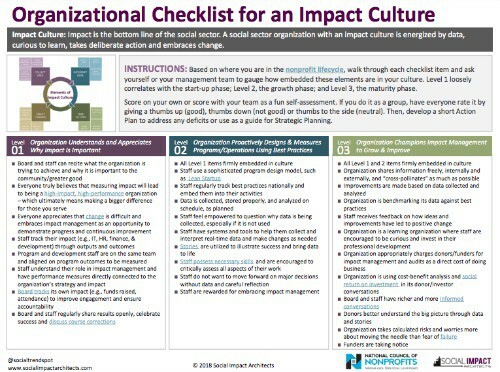 We hope you have found this checklist helpful and inspiring as you build an impact culture. In our experience, an impact culture goes beyond mere words and good intentions. It requires deliberate actions at all levels of the organization to encourage, support and implement it. We’d love to hear your thoughts on the checklist and how you measure your organization’s impact culture. * Many have asked us why we use impact management vs. evaluation. Two reasons: first, words matter. How do you feel when you are evaluated? Not good. Second, evaluation doesn’t go far enough. When you ask people to define it, it has limiting factors – reactive vs. proactive, success vs. failure, or good vs. bad. To energize people toward management and continuous improvement, we have found that the word evaluation DOES NOT work. And, yes, we have evaluated the word “evaluation,” which makes us total geeks.